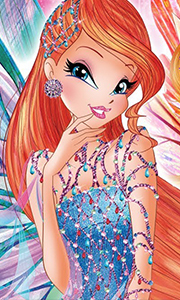 The Winx Club find themselves in a race against time to achieve the power of Sirenix and prevent Aisha’s evil cousin Tritannus from taking over the magic dimension. Plus, the girls hold a benefit concert to raise money to clean up an oil spill on Earth. Includes: The spill The rise of Tritannus Return to Alfea The Sirenix book The lilo The power of Harmonix The shimmering shells.. The Winx Club have their work cut out for them as they continue to rally the people of Gardenia to believe in magic again, try to strengthen their newfound powers of Believix, and help Roxy learn to master her newly discovered fairy powers, all while the Wizards of the Black Circle are hot on their heels! Includes: Hidden in the country Nebula's white circle The audition Superheroes The pets' pursuit Roxy's energy Bringing magic back..
Own Winx Club - Bloomix Begins DVD from Deff, DVD, Blu-Ray & 4K Video Specialists - Free UK Delivery.. It's magic and mayhem in these six thrilling adventures with Bloom, Stella and the rest of the Winx fairies. The Magic Dimension's future hangs in the balance! It's up to Bloom and Sky to unite the Sovereign Council and defeat Tritannus before he activates the Emperor's throne! Includes: A Perfect Date Listen to Your Heart The Shark's Eye Saving Paradise Bay Battle for the Infinte Ocean The End of Tritannus..
With the entire Magical realm in peril, can the Winx Club succeed on their most challenging quest yet - to attain the power of Sirenix and defeat the evil Tritannus in an undersea battle? With help from the Selkies, their newfound friends, Bloom, Stella, Aisha, Flora, Tecna and Musa take us on a deep-sea thrill ride in this spine-tingling conclusion to Season 5 of Winx Club! Includes: Secret of the Ruby Reef The Gem of Empathy A Magix ..